Just a quick information to you all. 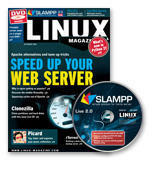 Vladimir Kolev has let me know that SLAMPP 2.0 also appears on LinuxUser Magazine 09/2009, one of popular Linux magazine in Germany. They also have bundled SLAMPP 2.0 together with some other major distributions on two full featured DVD. So, this is the issue you should not miss, guys. Best bargain! Thank you for your useful information, Vladimir. I hope everybody could enjoy using or running SLAMPP. FYI, I already started the development of SLAMPPLite 3.0, code-named “PUTRI”. What makes it different with its big brother is that I will only include one or two applications for each tasks. SLIM login manager and lightweight window manager will be used, XAMPP package will serve the web, database and ftp activities, plus other featured applications that are not going to be revealed now. I am sorry I can not provide you at the moment the exact ETA for the release. Let’s just hope it will be available soon and everything is going smoothly. I will keep you updated! Due to some bugs and glitches found in the previous release of SLAMPP 2.0, today I have released a maintenance version of SLAMPP. What has been done in this release? As it is a maintenance release, no major changes have been made. The system is kept intact. Fixed bugs and glitches found in the ZenInstaller, LiveClone, Lilofix, Gparted, and some rc. * files. Upgraded some desktop and server applications to the latest Slackware 12.2/current and Zenwalk snapshot repositories. Reorganized the boot process display. Now, the Yes/No answer of Use Proprietary Softwares information has been eliminated. Proprietary softwares have been installed permanently to enhance use experience. Further utilized rc.postinstall to detect and autoconfigure the X server on the fly. A downside part of these changes is that, it takes some time to complete the whole boot process until user reaches the graphical login manager. However, I am going to improve this in the next major release. OK guys, without any delay, please visit the SLAMPP website and download SLAMPP 2.0.1 now from mirror servers available over there. Regarding this release, I would like to express my sincere acknowledgment and thanks to Clinton Tinsley of Boise Linux User Group for his priceless support during the maintenance. I look forward to working with him on this going forward. May you have any concern, please let me know. Thank you for using SLAMPP. Of course it becomes a great honor to me that people at Linux Magazine have shown their interest and appreciation on SLAMPP. It is surely something that I never imagine before that this project will be on the cover DVD of such popular Linux magazine in the world. Even they also helped me in creating a new variant for SLAMPP’s logo (Thanks to Judith Erb at Linux New Media AG). Having said that, I am pIanning to incorporate the new logo in the next release of SLAMPP. We will see how it goes. WOW! It feels so good, dude! Once again, thanks so much, Linux Magazine. Your support to SLAMPP is priceless. Below you can download some information about the release. I have taken them directly from Linux Magazine. All are copyrights of the publisher of Linux Magazine. Unfortunately Linux Magazine is not on sale in Indonesia. So, if you have friends living in UK/Europe, USA/Canada or Australia, you can ask them to buy you a copy and post it to Indonesia. 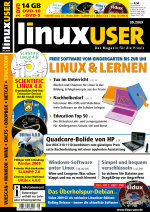 Or, order directly from Linux Magazine. Have fun using SLAMPP as much as I do and thank you all for your appreciation! Thanks God, SLAMPP is back listed on DistroWatch.com yesterday after over three years of inactivity. Thank you, Ladislav, for your kindness and cooperation in spreading SLAMPP news to the world. I really appreciate that. Read the full announcement on DistroWatch.com here. - Maintains the SLAX modularity. You can easily add new modules to SLAMPP. - Last but not least, there are many interesting features left to be explored by yourself. I also setup a new homepage to replace the old one, to indicate the new direction of SLAMPP. SLAMPP strives now for a good balance and combination between desktop and server. That is the reason why I mixed the command line and graphical applications onto one medium. I hope this new direction is not going to confuse you. Alright guys, I am not going to bore you with this announcement. Just visit SLAMPP at its new homepage over here, http://slampp.abangadek.com/info/ and grab your copy. Please download SLAMPP 2.0 aka Kalinda (1.9 GB) here. I would like to thank Slackware and Zenwalk development team, Tomas M. for Linux Live scripts, Romi Satria Wahono and all people of Brainmatics for their support in providing the development area and facilities and their companion during long development, Aminudin for uploading the huge iso file to the server, Luri Darmawan for his ideas and suggestions and last but not least, Harry Sufehmi for letting me use his server to serve the SLAMPP website and repository. Furthermore, I specially dedicate this release to my beloved spouse and daughter. Thank you for your patience and love. Have fun using SLAMPP, folks!